Lake Erie, the shallowest of the Great Lakes and the smallest by volume, makes most of the northern boundary of Ohio, including Cleveland. The lake is 241 miles long and touches Michigan, Pennsylvania, and New York as well as Ontario Canada. Lake Erie has an average depth of just 62'. 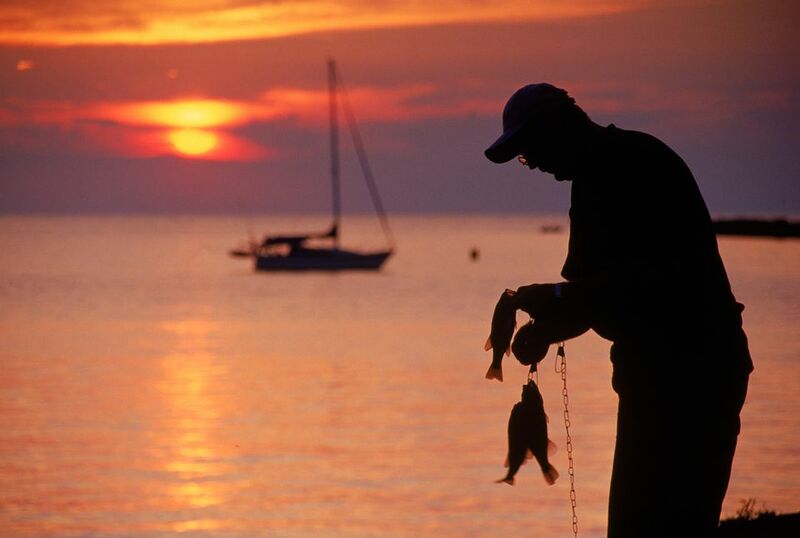 Fishing on Lake Erie is a popular pastime throughout the year. Hardy souls even ice-fish on the lake during the middle of winter. All those fishing on Lake Erie is required to have an Ohio fishing license. These are valid from March 1 to the end of February each year. Learn a little about eight of the most prevalent Lake Erie fish. The largemouth bass, also called a black bass, grows to be around 12" to 15" long. This Ohio native is found in virtually all over the state, especially in Lake Erie. The largemouth bass is typically around 1 to 3 lbs. The White Bass, also called the Silver Bass, is distinguished by its silver color and white belly. This fish is typically around 10" to 14" long and prefers open waters of no more than 30-foot depth. In addition to Lake Erie, White Bass is commonly found in the Ohio River and the streams and rivers leading off Lake Erie. Bluegill, also known as Bream, inhabit almost all lake, rivers, and streams in Ohio. These fish are typically around 6"-10" long, and although colors vary, all Bluegill have a black spot on their ear flap. Lake Erie Catfish, also known as Channel Catfish and Spotted Catfish, is an Ohio native. This tolerant species thrive in all kinds of conditions but prefers deep, still waters. Lake Erie Catfish average 12" to 14" in length and can reach 10 lbs. Black Crappie, native to western Lake Erie as well as other Ohio streams and rivers, prefer clear water with little vegetation. They are ​identifiable by the seven to eight spines on their dorsal fin. Though not native to Ohio waters, white perch have become established in Lake Erie and the rest of the lower Great Lakes. These small fish average 7" to 12" in length and weigh around 1/4 to 1 lb. The Northern Pike is a long, slender fish, native to Ohio. It is found primarily in the Lake Erie waters surrounding Sandusky and Maumee Bays. These fish prefer marshes and bays and average around 20" to 32" in length and around 2 to 10 lbs. Walleye, a medium-sized freshwater fish, is plentiful in the Great Lakes and the rivers and streams that flow from and into the Lakes. In Ohio, the fish is a springtime fishing favorite, particularly in the Maumee River near Toledo and in the Canadian waters of Lake Erie. Also called a Pickerel, this fish averages 14" to 22" in length and ​weighs an average of 2 to 4 lbs.